Immigration Part 1 – Where in the world is Kelly? 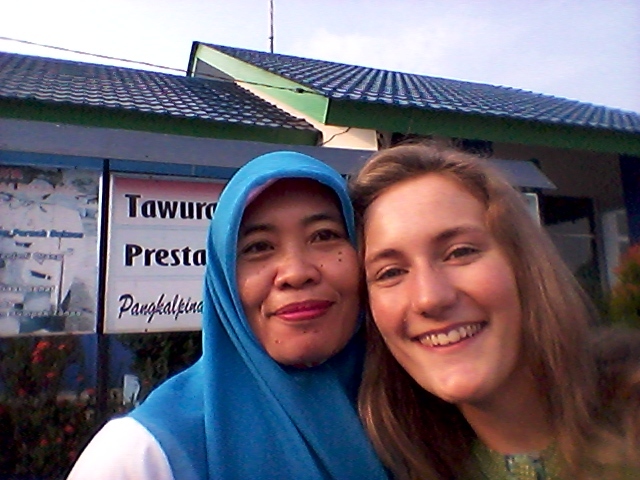 Ibu Isnaini (my co-teacher) and I in front of the school one morning last week. 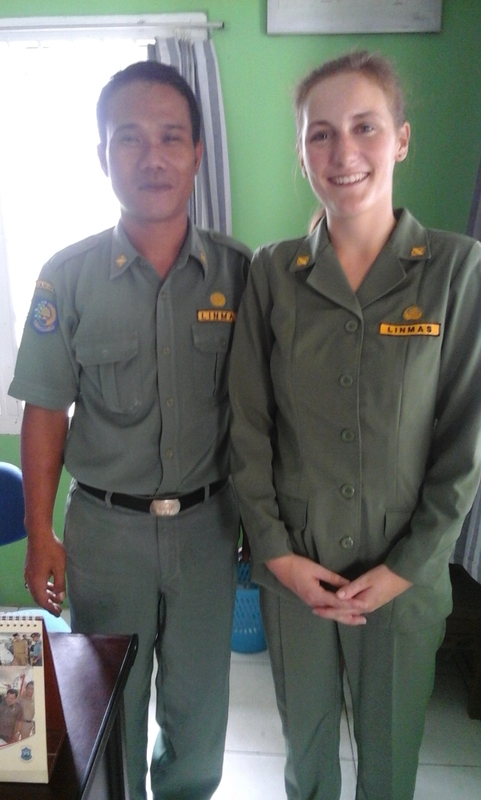 “You have to go to the police station now.” Pak Elvan informed me between classes this morning. “Now?” I hadn’t the faintest idea why this trip was required, but as a general rule it is better to go along with instructions from my school first and ask questions later. As last-minute as things seem sometimes, there is a method to the madness. “Yes, we leave now.” “But I have class!” After some gentle wheedling and a firm request for leaving at a later time from myself and Ibu Isnaini, Pak Elvan agreed that going to the police station was not a pressing issue and could wait until after class. Pak Elvan and Ibu Asro, my counterparts, accompanied me home to change out of my school uniform. I finally have teacher uniforms in both military green (Monday) and khaki (Tuesday). These are worn by all civil servants, i.e. 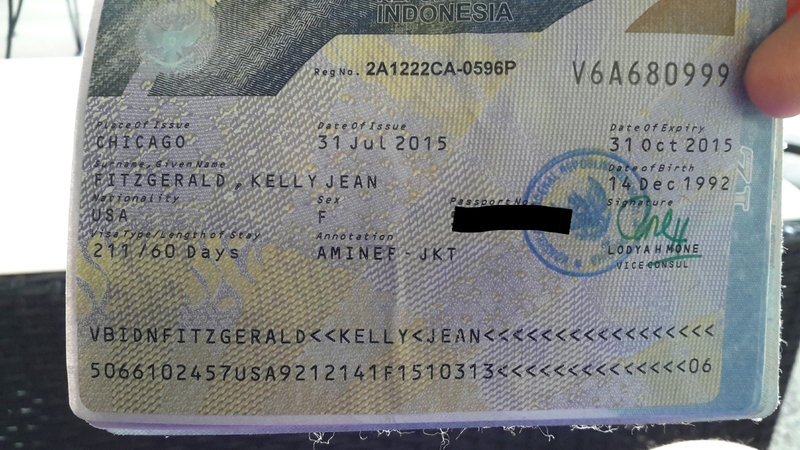 not just teachers, so I was asked to change as I am not actually a government employee of the Repulic of Indonesia. Then it was off to the police station (actually the provincial headquarters) in the outskirts of town to be introduced, as far as I could tell. If only I could wave a magic wand and turn this into a KITAS! 5 visits to the immigration office in Pangkal Pinang. Progress seems to be happening, at least in the interpersonal relationship department if nothing else. The man who appears to be the head honcho in the office and has been very stern in past visits relaxed a bit today, actually acknowledging me and even inquiring after the previous travels indicated in my passport. 4 total trips to visit my neighborhood’s leaders to both announce my/Caitlin’s presence as well as drop of passport copies in case they ever need them. 3 visits to the Indonesian consulate in Chicago. It should have only been two but I had to go back an extra time because of a (easily corrected) mistake I made in my paperwork. Thank you for bringing me one step closer! Most of the aforementioned visits are made in order to obtain a letter of some sort. I swear, by the end of this process I’ll have more letters than the alphabet! But in the meantime I think I am good to go in the visa department. Now all I have to do is wait, follow instructions when they come, and carry on with carrying on in Pangkal Pinang. Many thanks to AMINEF, who does a lot of the behind-the-scenes work in the process, and to Pak Elvan, one of my counterparts, who has been escorting me to all of this offices as well as teaching me more about everything from how to deal with ghosts to useful phrases in the local dialect (“I don’t have a boyfriend” and “Nice to meet you” have proven to be real crowd-pleasers) to the cultural hazards of accepting gifts from people you don’t know. Be on the lookout for “Immigration, Part 2” and hopefully many more posts coming soon! Lovely ladies at the Bukit Merapin District Office. Sounds like a lot of ‘red tape’, but you’ll get it done. Glad to see you are getting a lot of support. Keep posting. You are loved. Wow Kelly, sounds like you have your work cut out for you in the visa department. It’s a good life lesson, nothing’s ever easy. And by the way, your invitation to the All Hallows’ ball came. The theme is “Seven Deadly Sins”. Ezell and I are going as “Green With Envy”. Updates to follow. Is it ok if we give your tickets to someone? Your blog is most entertaining and well written .